This paper debates rural tourism, mainly the Country Homes in Madeira Island, centring on the link between the management of these tourism enterprises and the quality of services provided. Through the recognition of the owners’, of the Country Homes, profile it was our purpose to establish the relevance of the fulfilment of a Best Practices Guide for a better management of these enterprises, due to the reduced training/experience of their owners/guardians. In the quest of our goals we have applied the combination of qualitative and quantitative methods in the absence of studies of this nature on the island of Madeira, such as the release of questionnaire surveys, semi-structured interviews, field work and bibliographical and documentary research. This research enabled us to conclude that the application of a Best Practices Guide, which main role is to adjust the tourist practice, with the ultimate goal of promoting the quality of services provided by these tourist enterprises, will be helpful and will concur for the tourism development of the Country Homes in Madeira. The research focuses on cultural routes, as a type of a specific cultural tourism product, and the possibilities of their development. The study describes the main characteristics of cultural routes, taking into account and exploring the main factors that affect the development of such routes. 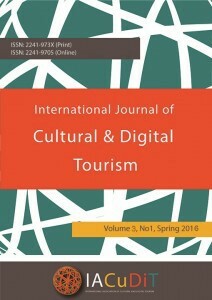 The aim of this paper is to deepen our understanding of the relationships between culture and tourism, to illustrate in which way culture drives touristic development. Owing to the Council of Europe’s interest and involvement in the development of cultural paths for the past two and a half decades, as well as the ever-increasing popularity of cultural paths in Western Europe, the main hypothesis of this paper is that cultural routes have great possibilities for providing the sustainable development of culture and tourism in the Southeast Europe. The maritime cultural landscape is a result of interaction between human processes on the coastal surface over time and the environment, which includes sea, coastal line and land. Parts of the maritime cultural landscape are the coastal historical remains and these underwater along with their surroundings. All they are the visible results of the human processes in the maritime environment. All they are influenced by the proximity of the sea. The main goal is to increase consideration of cultural heritage in maritime landscapes and to evolve cultural tourism in sustainable development context. The humans’ impact on the maritime environment is unique and it makes the places attractive for tourists’ attention. If we preserve the maritime cultural landscape, provide it with needed protection, and manage it effectively, it could successfully be implemented in the cultural tourism. And this type of tourism is a proven way for ensuring the sustainable development, in our case, of the seaside region. For example, the old traditional fishing and canning the fish should be revived, the local open fish markets might be reconstructed, the almost forgotten rituals and rites for good catch could be brought back to live, the local events and festivals should be developed again. The coastal line should be full of live as years ago. This is a way to show the motley, divers, and unique ethnological characteristics of the maritime cultural landscape, which will provoke the potential tourists’ attention. Furthermore, well-developed cultural tourism program can guarantee the sustainable development of the region. Cultural tourism is the intersection between cultural landscape and sustainable development. Effectively conserved, actively managed and attentively socialized the maritime cultural landscapes will bring benefits to the local population and to the sustainability of the seaside region. The year 2012 proved to be of great importance for the history of Tourism Education in Greece. The Greek State decided to -temporarily- pause the traditional State Schools for Tour Guides, after approximately 60 years of unceasing operation. The Greek government’s decision to involve University Schools in the venture of educating tour guides through “Intensive Courses for Professional Guides”, represents a really innovative step. According to the ministerial decision no 18062/20.12.2012 (Φ.Ε.Κ. 3401 Β΄), Human Studies graduates such us archaeologists, historians, archaeologists – historians, art historians, ethnologists, social anthropologists etc are eligible for becoming officially licenced tour guides after having successfully attended the Academic Course. The candidates are given a great opportunity to orientate their already university solid knowledge and skills towards a new direction. This new breed of tour guides is deeply aware (apart from History and Archaeology) of Contemporary Cultural Theories, Audiences’ approaches, foreign languages, Pedagogy, Museology, Architecture, Arts etc. Above all, they are in a position to communicate intimate interpretations, illustrating the intrinsic aura of objects, monuments, stories, in their original contexts. As Greece has a strong presence to a rapidly growing segment of the total tourist market, defined as Cultural Tourism this new kind of tour guide comes as the ideal professional expertise for performing a fully updated experiential narrative, concerning Heritage in all aspects. A smart tourism market willing to develop and improve it’s impact on economy should embody such a professional branch as a tool for a qualitatively profitable effect. Over the last 20 years, we assisted to a technology revolution and the Internet was the driver. The tourism has been appointed as a sector which more impacted with these technology changes, namely in what concerns the gather of tourism information or making online reservations. Usually, the process of searching starts by using a search engine and, actually, enterprises like Google do the tracking of its users behavior by using their own tools and make this data available to the public through the Google Trends tool. The purpose of this paper is to show that Google Trends data can provide important information to tourism stakeholders and help to understand the interests of foreign tourists in Portugal, earlier than the official statistical data. In the pursuit of our goals we correlated the Google Trends data on a set of search terms with official tourism data of Portugal. The paper demonstrates that Google Trends can provide information about the intentions of individuals about accommodations needs country wise or specifically in its tourism regions. The results show that the actual nights spent in accommodations establishments by the residents in foreign countries are strongly correlated with the Google Index, namely with residents in Spain.